As the chart above shows, major change is underway in the market. The concept of ‘affordable luxury’ is disappearing as the market polarises between affordability and luxury. As a result, pricing for Android-type phones has collapsed to $254, whilst Xiaomi sells its phones for just $220, as the chart from the Wall Street Journal highlights. 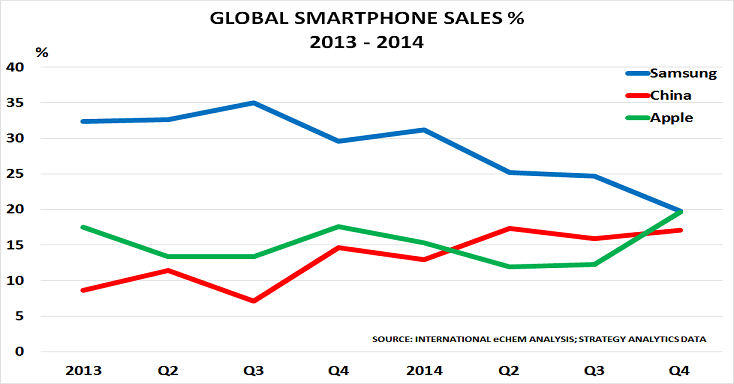 The smartphone market is thus just one example of the way China is exporting deflation to the rest of the world. It is also an excellent example of the way that the highly profitable middle ground of ‘affordable luxury’ is disappearing. The reason is the Great Unwinding of policymaker stimulus. It created a ‘wealth effect’ by boosting property and stock markets. And it fooled many companies and investors into believing the major emerging markets had suddenly become middle class. But as the WSJ notes, the top 10% of the world’s population controls 87% of its wealth. Thus you only need to have an income of $34k to be in the richest 1% of the global population. In India, probably the country with the most growth potential, average incomes are just $600/year. “Actual hardware is less and less important these days, and the services more and more important, so Apple will have to get services like maps and messaging right — as well as more complicated services like HealthKit and HomeKit, its frameworks for collecting health and fitness data and connecting to smart home devices”. Companies who hope to make money out of supplying Apple need to make the same shift. If they don’t, they will find themselves in Samsung’s position, with profits plunging along with market share.